Some of the animals do not seem too unhappy about Adder being left behind. Badgers says that they cannot leave her after everything she did. You mean all that hissing and stuff? asks Weasel. 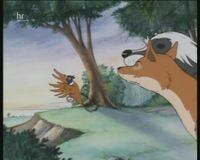 Eventually Pheasant volunteers to go back for Adder, as it will give him a chance to see his wife’s final resting place. He flies (badly) back to the farm and finds Adder in the barn. Then he is confronted by the sight of his wife’s body laying cooked on a roasting tray. 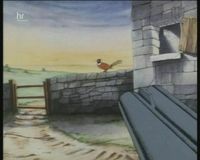 Overcome with with emotion, and despite Adder’s warning, Pheasant does not see the farmer with his gun… A shot rings out across the countryside, and the animals realise that they are going to need another volunteer. While Owl goes back to the farm, the animals make aquaintance with the resident rook colony, who invite them to join in with a singalong. That evening Adder and Owl decide to stay at the barn and hunt rats. 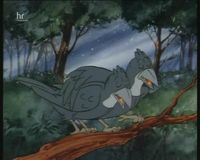 Back at the copse, many of the animals get emotional singing along to ‘Home Sweet Home’. Then Weasel and Toad take their turns at singing in an attempt to cheer everyone up. The following morning, Owl and Adder turn up and the party is together again. 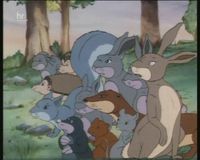 The animals are about to set off when a terrible squeal is heard: one of the baby Rabbits has got stuck in a snare. Mole comes to the rescue by digging under the post and setting the rabbit free, with nothing more than a sore throat. The animals say goodbye to the rooks and head off again. Next: Who Shall Wear The Crown?